Asus has launched ZenBook Pro 15 and ZenBook Pro 14 laptops with ScreenPad input device, VivoBook S15, VivoBook S14, VivoBook S13, and VivoBook Flip 14. The Project Precog- first convertible, a dual-screen notebook with fully enhanced AI features. Project Precog is the company’s first convertible dual-screen notebook with fully enhanced AI features. It comes with a 360-degree hinge joining the two displays so that the PC can be used in four modes — Stand, Book, Tent, and Flat. Asus says that its innovative form factor gets rid of the traditional physical keyboard and touchpad setup, replacing it with the flexibility to work as either an extended screen or as a customizable interactive interface. The AI Touch automatically recognizes the active input device and changes the virtual interface accordingly. It comes with built-in Window Cortana and Amazon Alexa. Other AI specific features include AI-powered Microsoft Office 365 and also supports the Intel Movidius Vision Processor Unit (VPU). Asus VivoBook S15 (S530) and VivoBook S14 (S430) are Windows 10 notebooks. The VivoBook S15 and VivoBook S14 weigh only 1.8kg and 1.4kg respectively and are just 18mm thin. An ErgoLift hinge raises the keyboard to provide a comfortable typing experience similar to a desktop keyboard and also improves cooling for better system stability. Asus VivoBook S15 and S14 feature new three-sided NanoEdge design that has even narrower bezels along the top and sides of the display. The laptops pack an 86% screen-to-body ratio, and VivoBook S14 an 84% screen-to-body ratio. VivoBook S15 and VivoBook S14 are powered by up to an 8th Generation Intel Core i7 processor with NVIDIA GeForce MX150 discrete graphics. The VivoBook S13 is the first ASUS notebook to feature a four-sided NanoEdge display and packs an 89% screen-to-body ratio. It comes with an up to an 8th Generation Intel Core i7 processor and NVIDIA GeForce MX150 discrete graphics. Asus VivoBook Flip 14 (TP412), it features a 360-degree-flippable display. The VivoBook Flip 14 has a thin 17.6mm profile and weighs only 1.5kg. It comes with an ASUS NanoEdge touchscreen with a 6.15mm-thin bezel bringing an impressive 82% screen-to-body ratio. It is powered by up to an 8th Generation Intel Core i7 processor with 16GB of memory and up to a 1TB SSD. The VivoBook Flip 14 also comes equipped with a touchpad-mounted fingerprint sensor for one-touch login via Window Hello and also supports the ASUS Pen active stylus. 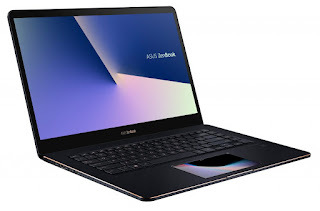 Asus ZenBook Pro 15 (UX580) comes with 8th Generation Intel Core i9 hexa-core processor, GeForce GTX 1050Ti GPU, 1TB PCIe x4 SSD, gigabit-class Wi-Fi and Thunderbolt 3 ports. It sports a 15.6-inch 4K UHD NanoEdge PANTONE validated display with 100% Adobe RGB color gamut and features Harmon Kardon certified audio system. Asus ZenBook Pro 14 (UX480) comes with up to the latest 8th Generation Intel Core i7 processor, 16GB RAM, and NVIDIA GeForce GTX 1050 MAX-Q graphics. It sports a 14-inch FHD NanoEdge display.It also includes Intel Optane memory support. It packs an infrared camera for facial recognition and built-in support for Amazon Alexa voice-powered services. The ZenBook Pro 15 (UX580) with ScreenPad is the first ScreenPad-enabled model in the series. Asus ZenBook S (UX391) sports a 13.3-inch 4K UHD NanoEdge touchscreen display, runs on Windows 10, It is also tested to meet military-grade MIL-STD-810G durability standards. It measures 12.9mm profile and weighs 1kg. powered by 8th Generation Intel Core processors and a superfast PCIe x4 SSD, and it also delivers up to 13.5 hours battery life. Connectivity ports include three USB-C ports support Thunderbolt 3. ZenBook S features Amazon Alexa support for easy voice-controlled assistance. Asus has also introduced the Zen AiO 27 all-in-one PC, it sports a 27-inch 4K UHD display and is powered by up to 8th Generation Intel Core i7 processor, 32GB of DDR4 RAM and NVIDIA GeForce GTX 1050 discrete graphics card.